Last week I shared Twelve Awesome Kitchen Gifts (that will actually get used) that are perfect for anyone on your list who loves cooking or baking (regardless of diet). 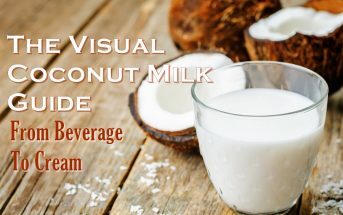 This week, I’m focusing on my crew with specific dairy-free food gifts – many of which fit other special diet needs, too (like vegan, gluten-free, paleo or even allergy-friendly). These delights are an extra-special way to show someone that you care about and understand their food restrictions or a fantastic way to show others how delicious dairy-free can be! These dairy-free food gifts include options for both Christmas and Hanukkah, and most are kosher parve. These are AMAZING dairy-free cookies – just see my review for all of the details – in several incredible flavors. 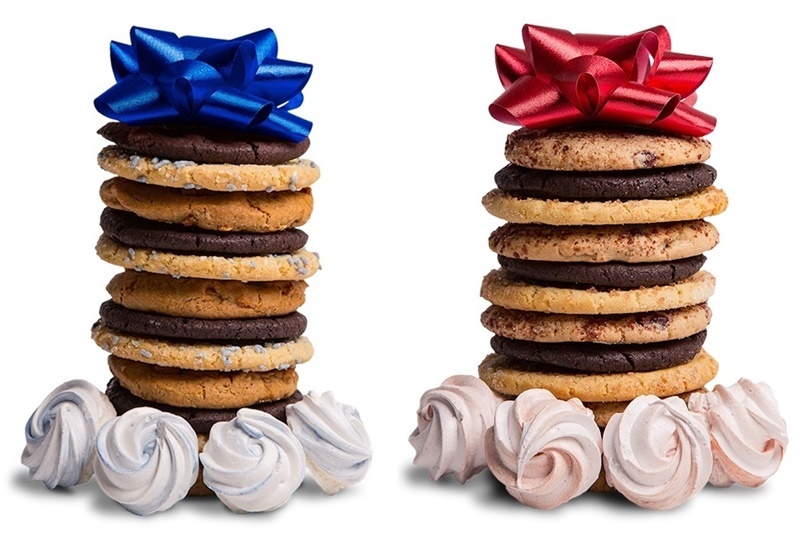 NoMoo Cookies come packaged in a pretty ribbon-wrapped box, and they offer several assortments, including a Christmas Gift Box and a Hanukkah Gift Box. NoMoo Cookies are made in a dedicated dairy-free and peanut-free facility (the original line does use eggs, tree nuts and wheat), they are certified Kosher Parve, and they have a new vegan / egg-free line! No doubt you’ve got at least one oenophile or perhaps a more casual wine connoisseur on your holiday list, and Frey is one vineyard they’ll want to savor. 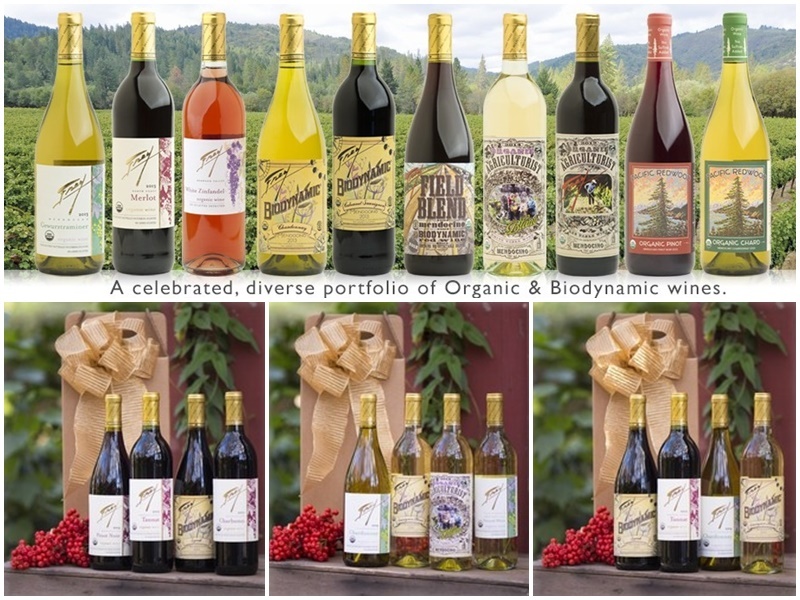 Not only are they America’s first organic and Biodynamic winery, they also have been producing award-winning varietals for decades that are all vegan, gluten-free and contain no added, headache-inducing sulfites! And yes, wine can contain dairy, egg or gluten (used in the fining process), but these do not! Frey Organic Wines can be found in stores – I’ve picked up a bottle or two on my way to parties – but on their website they also offer fully-wrapped gifts of Rockin’ Reds, Winter Whites, or Merry Mixed selections. Looking for more of a foodie assortment all wrapped and delivered? 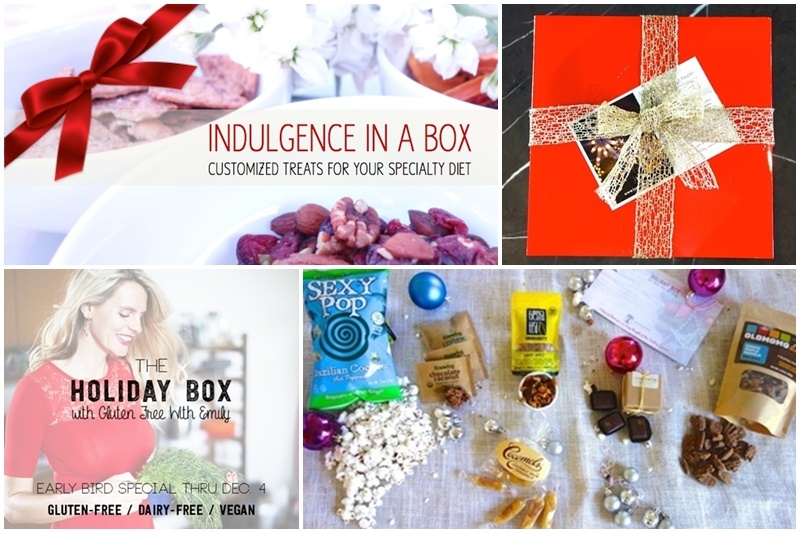 This personalized company offers quarterly treat boxes (you can gift a subscription) or one-time gift boxes (which can be customized for dairy-free, gluten-free, vegan, top allergen-free, etc). For the holidays this year, they are doing a special Gluten-Free & Vegan Box with Gluten-Free with Emily (she is a bundle of healthy energy, let me tell you!). There is still a special place in my heart for these scrumptious peanut butters (who wouldn’t be sucked in by a dairy-free White Chocolate Wonderful?! 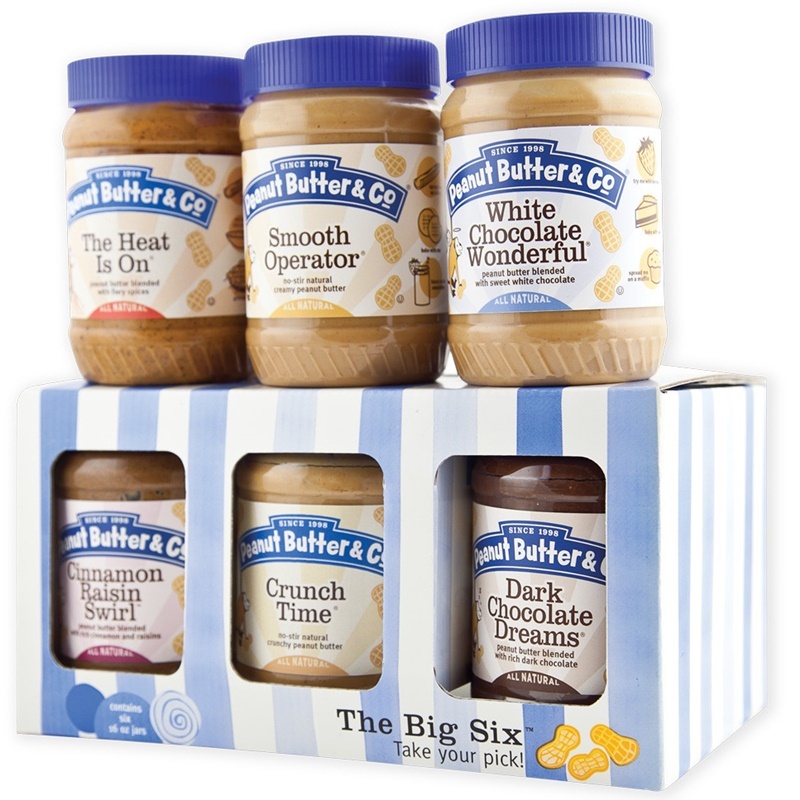 ), and their classic 6-Pack Assortment is still the ultimate gift in my opinion. They also offer several fun breakfast gift packs with oats, but note that the oats are processed in a shared facility with several allergens). Peanut Butter & Co’s Peanut Butters on their own (yes, even the Dark Chocolate Dreams) are certified gluten-free and made in a facility free of dairy, eggs, tree nuts and soy. All varieties are vegan, except for Bees Knees, which contains honey. 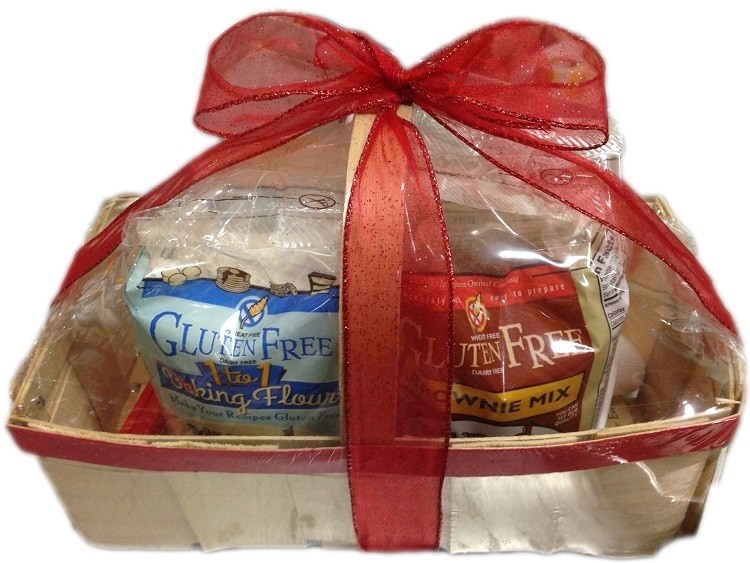 If your loved one has recently gone gluten-free and dairy-free, then a Gluten-Free Gift Basket straight from Bob’s Red Mill should be on order. The pre-wrapped gift includes their famous Pie Crust Mix, Vanilla Cake Mix, 1-to-1 Flour (new! ), and Brownie Mix, and comes complete with a bag clip and measuring spoons. 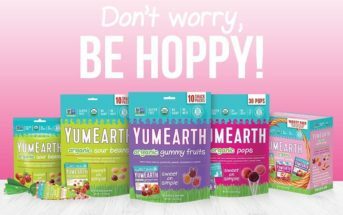 Note that these mixes are made in a dedicated gluten-free and dairy-free facility according to the packaging. 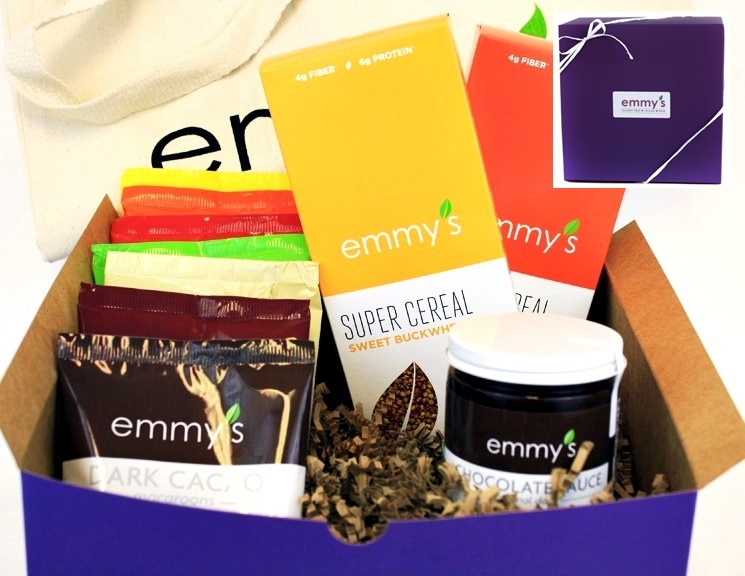 For the superfood fanatic in your life, Emmy’s offers a wonderful deluxe sampler gift with their entire collection of raw, gluten-free, vegan Macaroons, Sprouted Super Cereal and Chocolate Sauce, along with an Eco-tote Bag, and all packaged in a beautiful eco-friendly box. The presentation is attractive and every last bite is beyond delicious. This wonderful little company is already in my Best Dairy-Free Chocolate Gifts round-up, but they’ve been included in this dairy-free food gifts list, too, for their constant innovation. Every year, the head chocolatier, Yochy, creates new types of chocolates, fun new packaging (my favorite this year is that Santa bag – too cute! ), and so much gift-worthy goodness, it’s unbelievable. 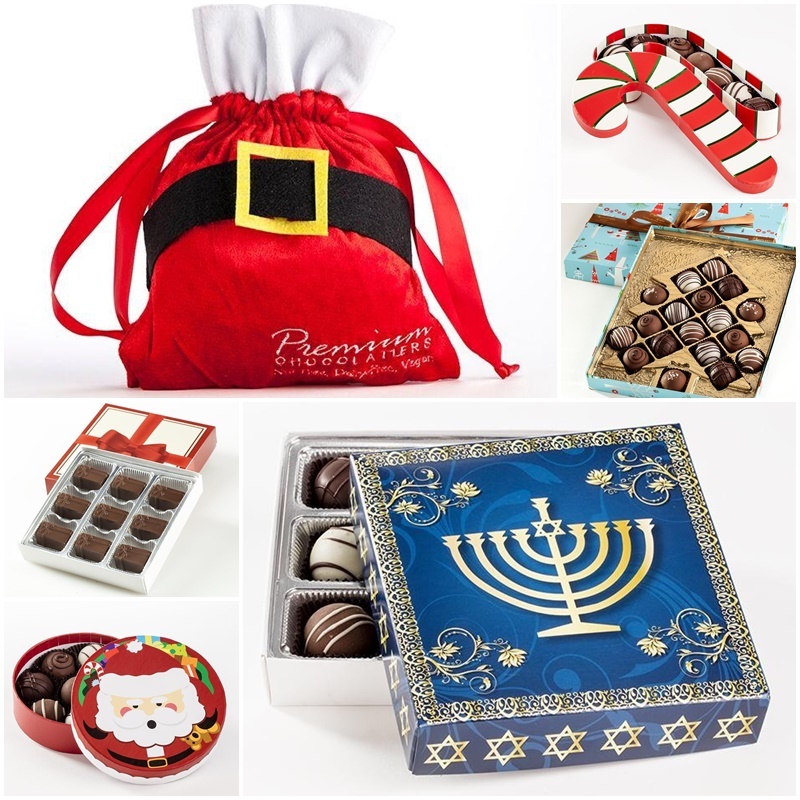 Yochy covers all the holidays, with delights for Christmas, Chanukah and beyond. Premium Chocolatiers sells direct, but they also have most of their chocolates on Amazon. 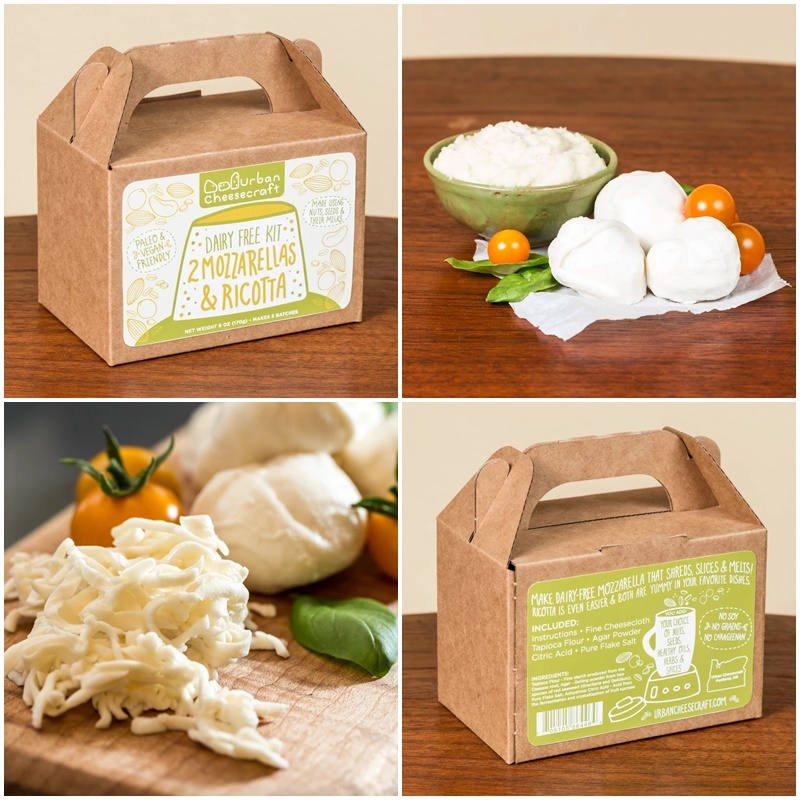 For the adventurous dairy-free, vegan or even paleo person, this DIY Mozzarella & Ricotta Cheese Kit is sure to please. It includes all of the tools and directions needed to make your own from cashews, almonds, white beans or even zucchini in just 20 minutes! It’s even gluten-free, and makes at least 10 lbs of dairy-free cheese from just one kit (in small or large batches, as you wish). 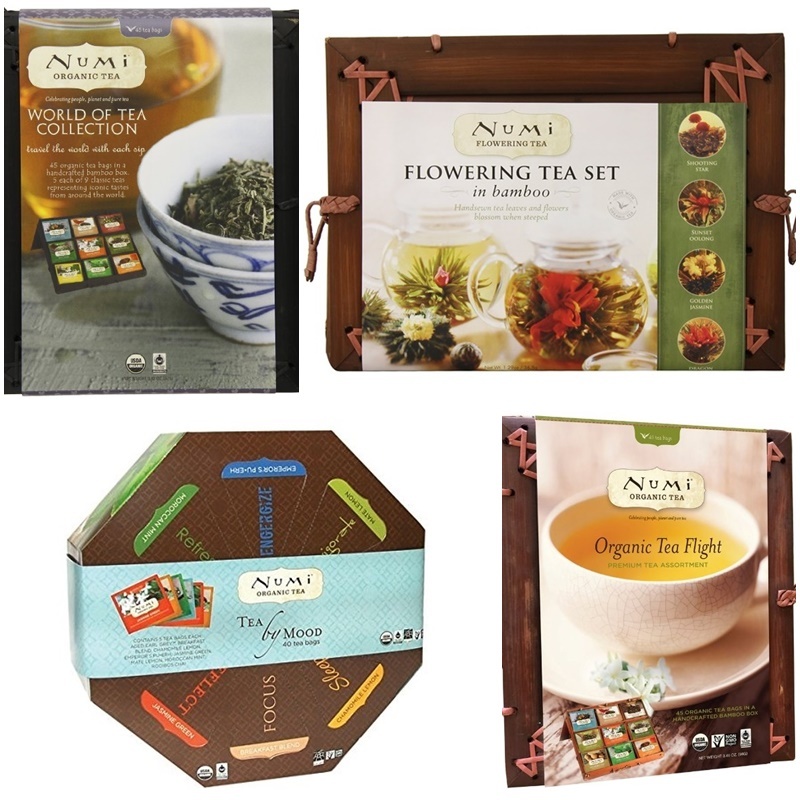 I love Numi Tea and have been trying, in vain, for years to get my husband to gift me their World of Tea Collection. And this year, I’m teased by even more warm boxed delights, including their Flowering Tea Gift, Tea by Mood and Tea Flight. And according to Numi, “Our teas do not come into contact with soy, dairy, or nut products. Our tea bags are compostable and made from Manila hemp cellulose. They are non-GMO verified, oxygen whitened and the tag is made from 100% recycled material and soy-based inks. They do not contain any gluten.” How’s that for everyone-friendly? Last, but certainly not least, a beautiful display of the best spices on the market, in my opinion (that picture is from my kitchen!). Though you may have to handle the gift wrap yourself, this amazing rack boxed with 16 high-quality, organic spices will be loved by just about anyone. The spices are readily sold in most natural grocers (for easy refilling), but you can also order them online direct from Simply Organic or via Amazon. 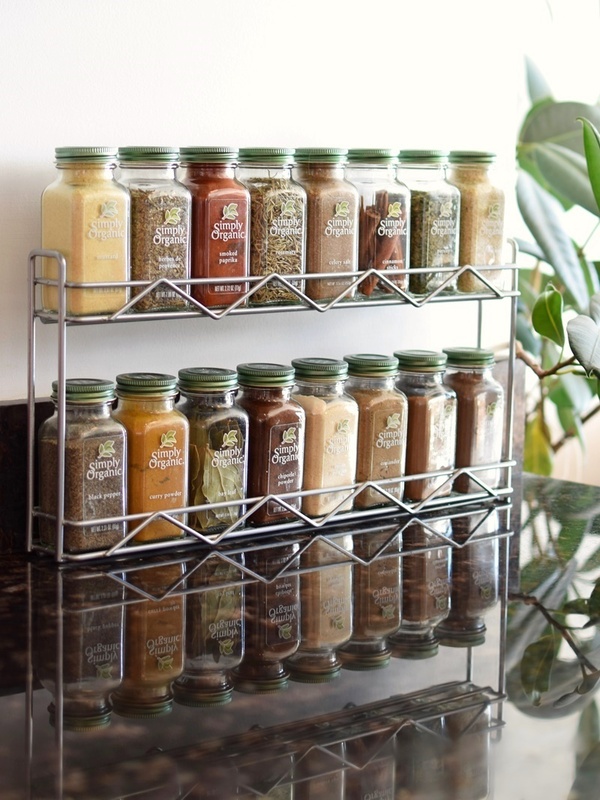 The Filled Spice Rack is only sold direct online from Simply Organic. 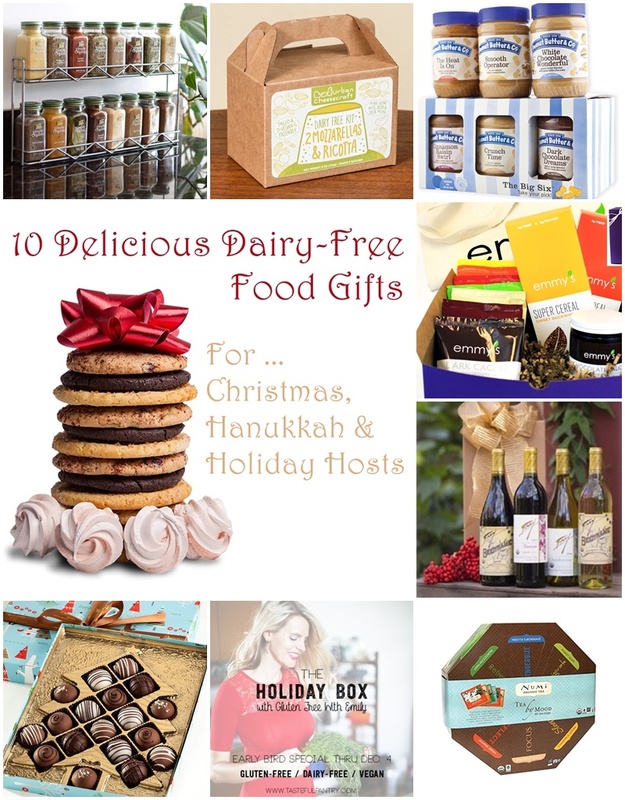 What are your favorite Dairy-Free Food Gifts? Comment to Share! Note that there are just a few Amazon links in this post (most are non-affiliated) and this isn’t sponsored in any way. This is my honest-to-goodness list of top picks! Amanda’s Own chocolates are a must have for stockings at our house! by Miyoko Schinner (you can find it on Amazon). What makes this book so unique is that the process is similar to real cheese — actually fermenting the cheese, not just adding lemon or vinegar that only kinda makes it taste cheesy — the cream cheese recipe made with cashews tastes and spreads like the real thing! That is definitely a great gift for adventurous cooks! Thanks for sharing Stephanie.